WILTON, Conn.— The Fotomat Corporation, whose blue and yellow kiosks are a familiar fixture in thousands of shopping centers nationwide, hardly needs more competition. In the fiscal year ending last Jan. 31, the company earned only $734,000 on revenues of $236.7 million, following a loss the year before of $4.7 million. It has not paid a dividend since mid-1979. So how is the company responding to the announcement last month by Technicolor Inc. that it plans to build a 1,000-unit chain of onehour photo finishing stores over the next five years? ”I’m absolutely convinced the one-hour mini-labs can’t produce the quality that we can, and they can’t produce at our price,” said Richard D. Irwin, chairman and chief executive of Fotomat, which offers overnight but not same-day service. This view finds support from James Chung, photographic analyst at Merrill Lynch, Pierce, Fenner & Smith Inc. ”It’s not going to be a problem for Fotomat, in that I don’t think this one-hour processing will take off,” he said. Established in 1967, Fotomat grew to include 2,269 stores eight years later, and net income reached $10.9 million. Over the next three years, however, while the chain added almost 500 stores each year, per-store sales fell 12 percent, and net income declined by more than 40 percent. ”The biggest single factor was our own ineptitude,” Mr. Irwin said. In the rush to create more outlets, management ignored Fotomat’s role as a merchandiser. New kiosks were put up near existing ones, cannibalizing sales, he said. Mr. Chung noted that Fotomat’s torrid expansion coincided with the increased availability of photo finishing services in pharmacies and supermarkets, often in the same mall where the kiosks were located. He also noted that the kiosks, staffed with a single person, were unresponsive to the seasonal peaks and valleys. Finally, Fotomat management missed the shift from Instamatic cameras and films, which made up ”around 90 percent of the business” in the early 1970’s, to 35-millimeter film, which represents 50 percent of total exposures today, Mr. Irwin said. In December 1978, Fotomat introduced Series 35, a merchandising effort to capture the 35-millimeter market by stressing higher quality processing and larger prints. ”It’s been a fabulous program,” Mr. Irwin said. 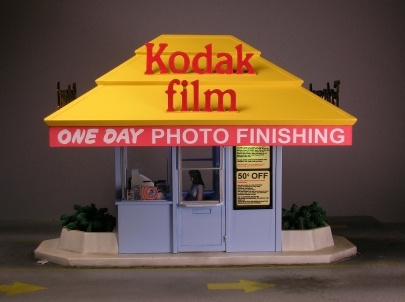 To accomodate that demand, Fotomat has been replacing kiosks with a new, larger design for its retail outlets. There are now 500 such units, which commonly sell accessories. They also provide room for Fotomat’s growing videotape business. In 1978, Fotomat began selling a service that transfers 8-millimeter home movies to videotape cassettes, and began carrying blank tapes. The transfer business, while profitable, has grown slowly, but sales of blank tapes, also profitable, is growing ”extremely rapidly,” Mr. Irwin said. But a 1979 entry into rentals of prerecorded tapes ”is costing us a bunch of money,” he said. While these businesses ”could easily” comprise more than a third of Fotomat’s total sales in five years, photo finishing now still makes up more than 90 percent of the business. Extremely weak photofinishing sales in the quarter ended April 30 left Fotomat with a loss for the three months of $2.3 million, only slightly better than in the 1980 period. And the 1981 results were lifted by an after-tax gain of $1.5 million on the sale of a California office building and a Canadian film lab. Furthermore, high interest rates forced Fotomat to postpone a $63 million photographic paper plant it had planned to build in the United States with the Konishiroku Photo Industry Company, the Japanese giant that owns 8 percent of Fotomat’s stock.